William M. Fischer has stepped down as associate dean for student conduct and risk management after having served under one year in the position. Fischer, who resigned this summer, declined to discuss his future professional plans in detail. He said he “just had a number of professional opportunities that came along” that convinced him to leave. Fischer will continue to work with the Student Life Office as a consultant on discipline issues this fall, said Dean for Student Life Larry G. Benedict. The Student Life Office will not hire a new dean until the completion of an ongoing review of the discipline process; hence, the position is unlikely to be filled this fall, Benedict said. The committee conducting the review is “looking at the structure of the discipline [process] and how to make it better,” said Lorna J. Gibson, chair of the faculty, who is chairing the committee. An undergraduate and graduate student are also serving on the committee, and the details of the review are not yet public, she said. In the interim, Benedict said, current administrators, including Barbara A. Baker, associate dean for Student Life Programs; Daniel Trujillo, associate dean for Community Development and Substance Abuse; and Margery Resnick, chair of the Committee on Discipline, will work on a transition plan and fill in for Fischer’s position. Fischer said he does not know if he will be involved with the search for the next dean. The next dean should have a “philosophy that student conduct provides an opportunity to help students learn and grow from mistakes they may have made,” he said. 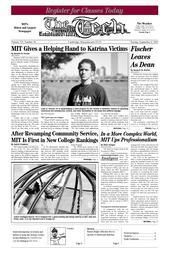 Benedict said he was surprised when Fischer sent him his resignation letter, and that he and Fischer “got along very well both practically and philosophically.” Fischer’s predecessor, Steven J. Tyrell, also left MIT after about one year serving as associate dean for student discipline.